This isn’t the most original addition to our billboards section, but creative advertising in a form of optical illusion is something I have been propagating for ages now. How come those stupid big corporations never listen to me? Why don’t they simply hire professional designers for their ad campaigns, banners and online advertising, and make them integrated with optical illusions? They would get amazing reactions and high amount of visibility. Their ads wouldn’t pass unnoticed. Let me put this simple: we have all developed banner-blindness on websites we visit, and traditional IAB banner standards simply don’t work anymore. 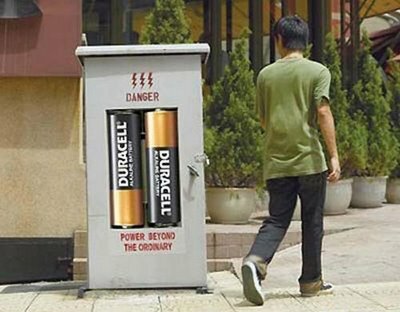 If for example, specifically targeted ad for this website was created in a manner like the below Duracell advertisment, it would be part of this site’s content, and would attract enormous response, but what is more important targeted and quality content for our community as well. In this way, we could all get rid of those annoying ads in the sidebars, headers and footers of our websites, and concentrate on the content, which would be advertisement it self. What do you think about this? I think this could apply to all categories and markets, optical illusionary marketing I mentioned was just an example. Interesting approach was done by Sony few years ago, with their posters for Bravia. But still, it didn’t provide complexity which it could potentially produce with more original and complex illusions. What are your thoughts on this? looks vers funny, i would like to own one of these for my car. The one on the car was genious. The other one wasn’t that awesome. i want that thing for the car! i agree tho the other one isnt that good. the first one’s okay, and the second one is not a sticker. it’s a really bad photoshop job, but it still looks cool. 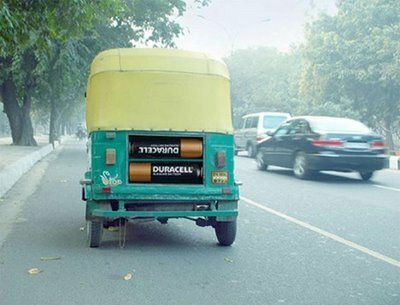 I think that’s the new kind of electric car. Je crois que c’est la nouvelle génération d’auto électrique! umm idk what the second one is, but it is not a really bad photoshop job. Well, if I were to put it on my car I would want it to be on a magnetic sheet, so I could easily move to a new car when necessary. But if it were really a car that runs on dry cells, then that would make $3.50/gal for gas look good! Nice couple of shots. I’m sure the initial, “wha’tha. . ?” is pretty good on these when seen from the right context in the wild. Really funny, do you think we can get it somewhere? I’m wondering if it’s accessible for consumers..
okay first it isn;t a car it’s a tuk-tuk there 3 wheeled moped style things which you find in asia and people use as taxi’s second the tuk-tuk isn;t photoshoped because there’s advertisement everywhere just so they can get a little money people cover there houses in it ! coolio! it looks so real! The place in the second place is India. Those tuk tuks are called auto there.